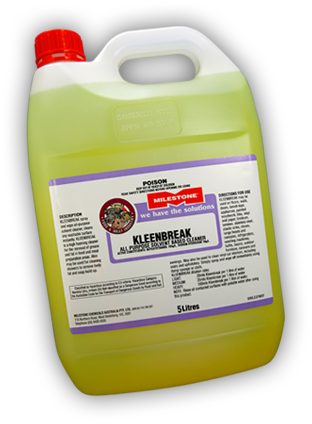 High solid, solvent boosted alkaline cleaner for use on floors, walls, exhaust fans, vents, ceilings, benches, and most other hard surfaces. Designed for the efficent cleaning and removal of grease, fats and oil. Read about what make Milestone Chemicals the company it is today. Safety Data Sheets for all of Milestones product range. Search for a Milestone Chemicals outlet via our live map search. Have questions? Make an enquiry via email to our responsive staff. View Information on CLS dispensers, provision, laundry services, etc. See if Milestone Chemicals can enter to the needs of your company. Links to associated businesses and suppliers of our business. Visit our product sales area to get the best deals on our selected products.